Brushed finished 18kt rose gold case with polished finished corners. Brushed black ceramic bezel with with polished finished corners. Black ceramic crown with brushed rose gold tip bearing the AP logo. Sandblasted rose gold button guards are attached to the case with hex-head screws. Sandblasted rose gold buttons with black ceramic tops. 4 18kt rose gold links attaching the case to the strap. Black main dial with the "Mega Tapisserie" design. 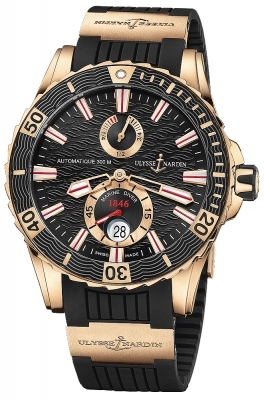 Black recessed sub-dials with a very fine concentric circular guilloche texture pattern & rose gold colored printed indications. Sub-dials with thin rose gold rims. Applied polished rose gold index hour markers with luminescent fill center strip. 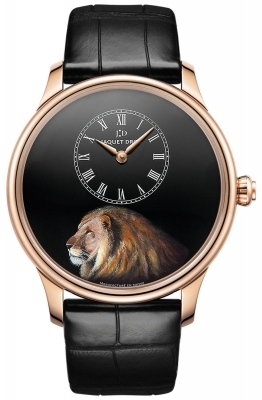 Rose gold dial rim with fine printed black minutes/seconds & fractions of a seconds track. 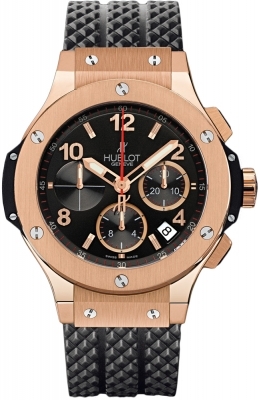 Polished rose gold time related hands (hours, minutes & small seconds at the 12 o'clock sub-dial). Hour & minute hands with luminescent center strip. 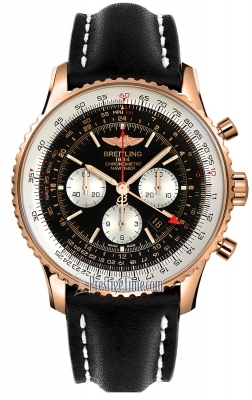 Black raised dial-flange with rose gold colored Tachymeter scale. Chrono related hands are red. 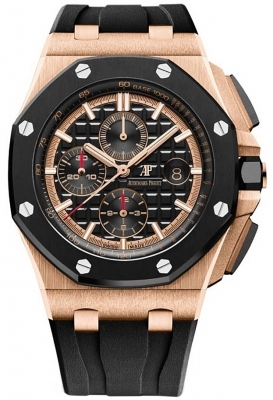 Continuous running small seconds sub-dial at the 12 o'clock position. AP Caliber 3126/3840, beats at 21,600 vph, composed out of 365 parts, contains 59 Jewels & has an approximate power reserve of 60 hours.